HACKtheMACHINE, a collaborative “Blue Angels for Geeks” held in Seattle on September 21-23, hosted by the U.S. Navy, Booz Allen Hamilton and Fathom5 unites private sector technologists and the Department of Defense in digital engineering, solving complex problems with profound implications for global security. Convening a group of over 500 technologists, academics, entrepreneurs and military officials, HACKtheMACHINE Seattle served as the Navy’s premier digital experience. Participants competed, learned and engaged in solving problems that span the Navy’s challenges across maritime cybersecurity, artificial intelligence and development operations. The three tracks of the event focused on “Maritime Capture the Flag,” “Data Science and the Seven Seas,” and “Hack for the Oceans.” Competitors built cross-disciplinary teams that bridged the Navy, academia and industry to develop innovative approaches to complex problems. Each of the three tracks was sponsored by a Navy program manager who took insights from the crowd and turned them into relevant military outcomes. 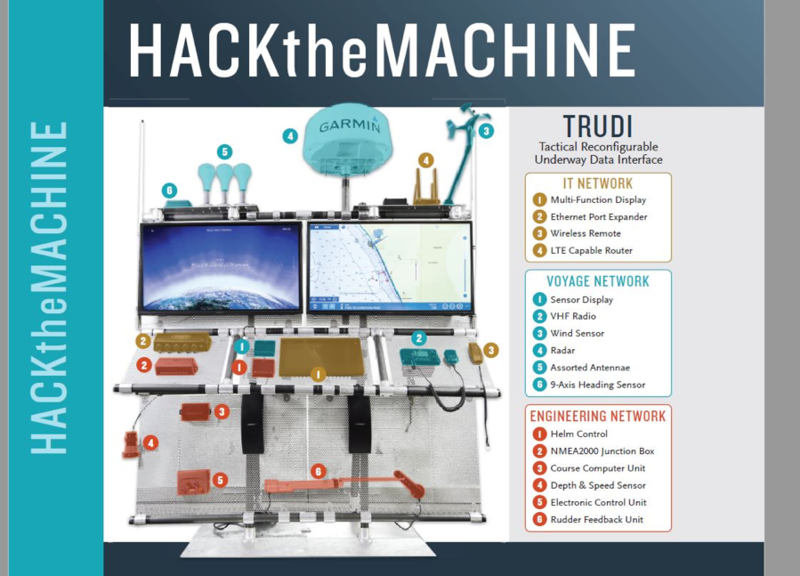 For the Maritime Capture the Flag track, Booz Allen’s elite team of engineers conceptualized and built TRUDI, a fully-functional model of the networked systems that equip connected maritime vessels. Insights from Maritime Capture the Flag track will inform design requirements that the Navy will use for the installation of programmable logic controllers aboard ships, whereas lessons learned from the Data Science and the Seven Seas track to build tools that support safer navigation. Other ideas from the event will be used to provide future Consolidated Afloat Network System developers with ideas to accelerate the use of agile and DevOps processes. The Navy’s Cyber Warfare Development Group will use lessons learned to implement high velocity learning for new engineers who may not be aware of specific technologies in the maritime domain. “As a central hub for innovation, HACKtheMACHINE serves as a gateway for entrepreneurs and companies to partner with the Navy. It provides mentorship opportunities for non-traditional partners who otherwise would not interact with the Navy. And, it seeks to inspire a new generation of talent to apply their skills to the ever-evolving digital challenges that can only be solved through partnership,” added MacCarthy.